Schluter®- DILEX-BWS is a prefabricated surface joint profile featuring rigid PVC anchoring legs that protect tile edges and a 3/16" wide soft CPE movement zone that separates individual fields in the tile covering and forms a visible surface. 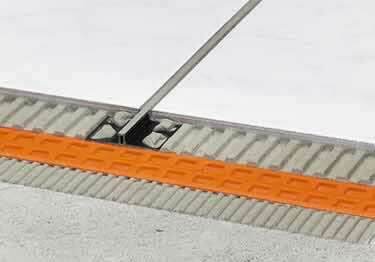 DILEX-BWS reduces stress and allows movement in large, tiled areas. It helps prevent cracking and delamination of tiles. Suitable for use in residential to medium-duty commercial applications subject to light mechanical loads. The CPE movement zone is available in a variety to colors to match the grout. Heights: 3/16",1/4, 5/16", 11/32" 3/8", 7/16", 1/2"
Suitable for residential to medium-duty commercial applications subject to light mechanical loads. Heights: 3/16", 1/4, 5/16", 11/32" 3/8", 7/16", 1/2"
Available Heights: 3/16", 1/4, 5/16", 11/32" 3/8", 7/16", 1/2"
Schluter®- DILEX-BWS is a prefabricated surface joint profile featuring rigid PVC anchoring legs that protect tile edges and a 3/16" wide soft CPE movement zone that separates individual fields in the tile covering and forms a visible surface.